Mimì – Ocarina Green Edition is the special version of Ocarina pure Green dedicated to Nature and its protagonists. In addition to the playlists in the Ocarina classic ed., on Ocarina Mimì you can find audio tracks that talk about the environment from every point of view. From classical music inspired by the natural element to themed fairy tales, from sounds of nature to documentaries on animals. Green is the color of nature, of spring’s awakening and of life itself. It means strength, balance, stability, solidity, constancy and perseverance. The tracks present inside Mimì are intended to stimulate the tuning with the natural element and to raise the desire for outdoor activities. 75dBA maximum volume, calibrated to protect hearing when listening closer. Extendable to 90dBA under the supervision of an adult. Into My Account, the website section reserved for customers, an update is available allowing you to unlock Ocarina’s volume permanently. 1.4″ screen with blue LED backlit. 8 GB. It can contain over 1000 tracks and up to 100 minutes of recordings (10 recordings of 10 minutes each, in .wav format). Like a normal external memory, tracks are manageable by connecting to a computer via the cable included. Double structure with high resistance internal material and external coating in anti- shock rubber, certiAied for food use (CertiAication FDA, Food and Drug Administration – USA). 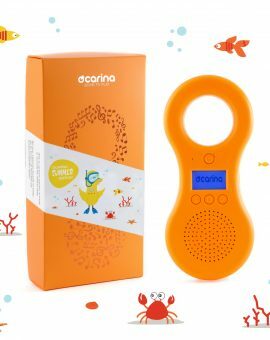 Built-in microphone enables to record at all times (just hold down the Goose button for 3 seconds). The rubber coating protects the electronic card. Compatible with Mac, Windows and Linux. Supports all major audio formats: MP3, WAV, OGG, M4A and many extensions. Micro USB socket and 3.5 mm audio output. Ocarina can be listened to with headphones, connected to home or car stereo. 2 year warranty on manufacturing defects. (In Italian and English) accessible from My Account. Just send a return request within 15 days from the date of purchase through My Account. Off course the pack and all its contents must be intact and complete. N.B. 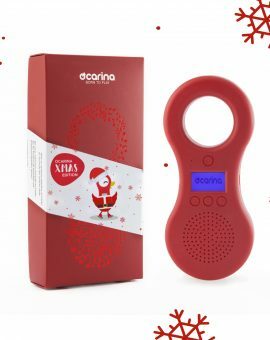 Ocarina is not a toy but a device for playback of audio tracks in electronic format. Using Ocarina must take place under the careful supervision of a responsible adult. 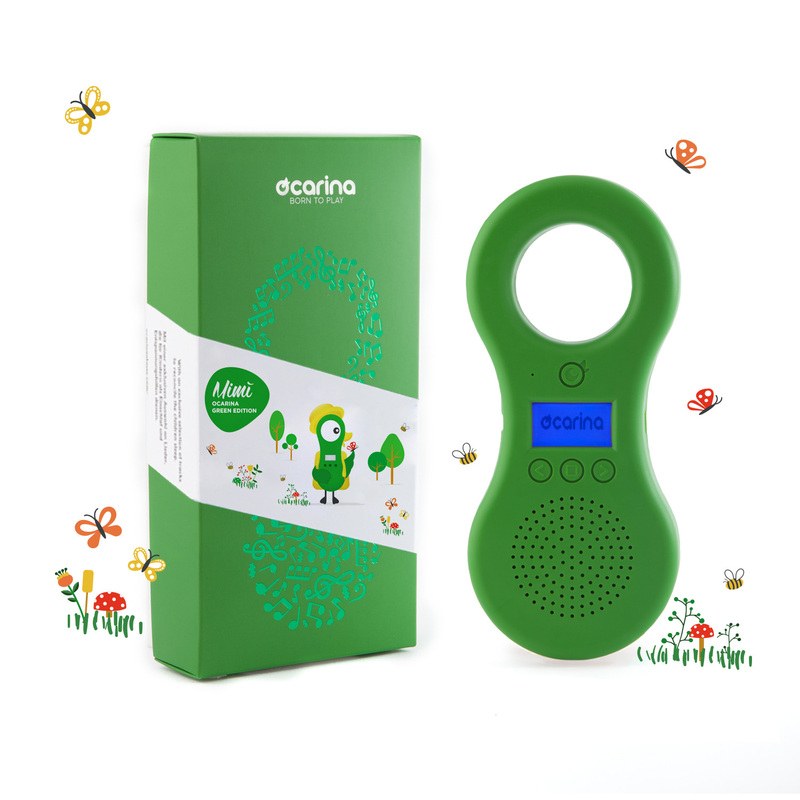 Mimì – Ocarina Green Edition contains three special ‘ecological playlists’ and a selection of fairy tales dedicated to Nature in 4 different languages, as well as all the tracks of Ocarina classic edition. The tracks in Italian are original productions by OcarinaSound. Exclusively for Mimì, the new original fairy tale Pesciolino e il grande serpente di mare, based from a story by H. C. Andersen. The new project Amici Animali, a playlist with three audio documentaries to discover some animals in their everyday life, offers an intimate and fascinating way of listening to the natural world. The tracks in French, English and German are original productions and are the result of the collaboration of Ocarina with the most important European publishers of the sector. Bloom – Children’s Radio – is a Parisian reality that develops audio content in French with innovative formats. Storynory since more than 15 years is the largest independent producer of audio fairy tales in English. Vorleser.net offers a growing collection of classic children’s stories in German.